Legend: B.C. dates at top of timeline are approximate. Note that 931BC marks the division of the Kingdom into Southern Tribes (Judah and Benjamin) and Ten Northern Tribes. To avoid confusion be aware that after the division of the Kingdom in 931BC, the Southern Kingdom is most often designated in Scripture as "Judah" and the Northern Kingdom as "Israel." Finally, note that 1Chronicles 1-9 is not identified on the timeline because these chapters are records of genealogy. 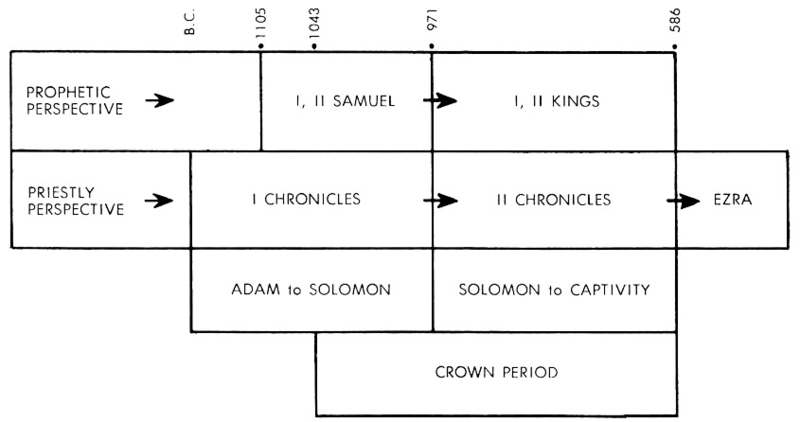 1 Chronicles covers the same period of time as 2 Samuel and both describe the reign of David (See the Timeline above) whereas 2 Chronicles covers the same period of time as 1 Kings and 2 Kings and both describe the time from Solomon to the Babylonian Captivity. In Chronicles the kings of Israel (See table below where Jeroboam I identifies first of the kings of the 10 Northern tribes) are not mentioned unless they do something that relates to the kings of Judah. Note that the word "chronicle" means "a continuous and detailed account of historical events arranged in order of time." In First and Second Chronicles God has given us a very accurate history so that we can know all that He wants us to know about the period of the kings. In the Hebrew, these six books are only three, each pair forming but one book. Samuel and Kings form a consecutive history. The Key-note of both is Kingdom. Chronicles is the story of 2Samuel and 1 & 2 Kings told over again from a different standpoint. Its Key-note is Theocracy. It deals only with the Kingdom of Judah, and relates to the history as it touches the Temple and the worship of God. It was possibly written by Ezra. The special privilege of the Children of Israel was to have God for their King, and to be chosen by Him to be a peculiar people unto Himself, to show forth His praise in the world. 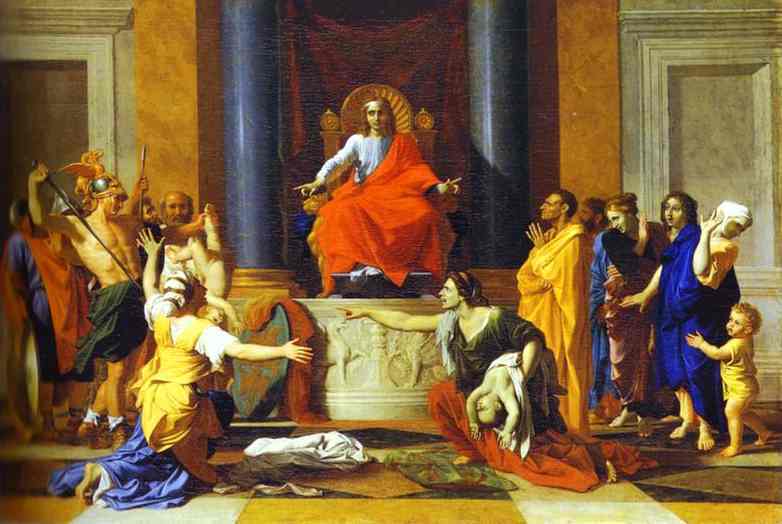 During the period of the Judges, Israel had rejected God from being their King. This rejection reached a climax in Samuel's day, when ''they asked for a King like all the nations'' [1Sam 8:5,19,20]. When God's children are afraid of being different from the world around them, they lose their power of testimony for Him. God gave them Saul-- a King after their own heart. When Saul broke God's covenant through disobedience, God gave them David-- ''a King after His own heart'' [1Sam 13:13,14]. David was a type of the one perfect King. Solomon, likewise, was a type of Him. But after Solomon, God's power departed from the kings and became vested in the prophets. Elijah sent word to Ahab, ''Behold, Elijah is here! And Ahab went to meet Elijah'' [1Kings 18:8,16] As [D.L.] Moody said, ''Who was king now?'' Moses was a prophet. Samuel was a prophet, as well as being the last of the Judges, and also priest. But the great line of prophets began with Elijah, and they represented God to His people through all the years of the decline and fall of the monarchy. We need the magnificent reign of Solomon, the Prince of Peace, to complete the picture of Christ our King. The Lord said to David: ''Behold, a son shall be born to thee, who shall be a man of rest; and I will give him rest from all his enemies round about; for his name shall be Peaceable, and I will give peace and quietness in Israel all his days.'' Solomon's peaceable kingdom was the result of the victories David had obtained. [Likewise,] it is because Christ has fought and conquered our enemies that we can enjoy the peace of His glorious reign in our hearts. The Kingdom of God is ''righteousness, and peace, and joy in the Holy Ghost'' (1Chron 22:9, margin; Rom 14:17). The glory of Solomon's reign was the building of the Temple. He seems to have been raised up specially for this purpose, for David says: ''He hath chosen Solomon my son to sit upon the throne of the kingdom of the Lord over Israel. And He said unto me, Solomon thy son, he shall build My house and My courts… Take heed now, for the Lord hath chosen thee to build an house for the sanctuary: be strong, and do it'' (1Chr 28:5-10). But for the account of the Temple, we will wait till we come to the Book of Chronicles. The wisdom of Solomon is a foreshadowing of the wisdom of Christ, in ''whom are hid all the treasures of wisdom and knowledge'' [Col 2:3]. She brought all her hard questions to Solomon, and communed with him of all that was in her heart. We may bring all our difficulties to the Lord, and we shall find, as she did, that ''there is not anything hid from the King'' which He cannot solve for us. We, too, shall find that He is ''made unto us wisdom'' [1Cor 1:30]. Then follows the history of the divided kingdom-- a picture of the divided heart and of the impossibility of serving two masters. The kings of Israel [the northern kingdom] followed the example of ''Jeroboam, the son of Nebat, who made Israel to sin,'' by setting up the worship of the golden calves, and all their kings were given to idolatry. The history of the Kingdom of Israel is an almost unbroken story of wickedness, king after king coming to the throne through the murder of his predecessor. 2Kings 17 gives us the account of the Captivity of Israel, and goes fully into the reason of this punishment. They had descended to the very level of the nations whom God had [commanded] His people [to] drive out of the land-- exactly what He had predicted, as the result of their disobedience, had come to pass. They forsook the Lord, and served the gods of the heathen, and walked in their ways, and wrought according to their wickedness, and therefore God permitted the King of Assyria to carry Israel away captive into Assyria, according to His warning, given by Moses in Deu 29:24-28. ''And the Lord rejected all the seed of Israel, and afflicted them, and delivered them into the hand of spoilers, until He had cast them out of His sight'' (2Kin 17:20). Long before the outward semblance of royalty had disappeared, God had transferred the power from the kings to the prophets. Out of the darkness of this evil time, two figures stand forth as His witnesses, showing us that through all the failure, God was quietly working onwards towards His eternal Kingdom of Righteousness. Elijah and Elisha, in the contrast of their characters and of their mission, remind us of John the Baptist and of our Saviour. Our Lord Himself referred to John the Baptist as fulfilling the prophecy that Elijah must first come before the coming of the Son of Man. ''Elias verily has come,'' He said [Mat 17:10-13]. Elijah the rugged prophet of the wilderness, clad in his mantle and leathern girdle-- the ordinary dress of the Fellaheen [sic. ], which every prophet wore-- suddenly bursts upon the scene in the court of Ahab, and pronounces the judgment of the Lord. ''As the Lord liveth, before whom I stand, there shall not be night-mist, nor rain these years, but according to my word'' [1Kin 17]. [Note: ''The matar or 'rain' falls at all hours during the winter, while the tal or 'night-mist' falls in the night in summer and autumn.'' (Rev. J. Neil)]. The secret of his power lay in those few words ''before whom I stand.'' He knew what it was to have power with God, and therefore, he had power with man. He reminds us of John, clad in the same manner, at the court of Herod, denouncing, as fearlessly, the sins of that king [Mar 6:17,18]. On Mount Carmel [1Kin 18], it was ''at the time of the offering of the evening sacrifice'' that God sent the fire from heaven. We have several instances of deliverance coming at the time of the morning or evening sacrifice, reminding us of the power of the Cross which those sacrifices foreshadowed. When God was about to send the rain in answer to Elijah's prayer, Elijah sent Ahab the message, ''Prepare thy chariot, and get thee down, that the rain stop thee not.'' [1Kin 18:44]. And then it appears that Elijah acted the part of sais to Ahab. The modern sais of Egypt is the ''runner'' attached to the household of kings and nobles. The same custom was in vogue in Israel, for Samuel warned the people that the king they so eagerly desired would exact this oppressive custom of his subjects: ''He will take your sons, and appoint them for himself, for his chariots, and to be his horsemen; and some shall run before his chariots'' [1Sam 8:11]. ''These facts lend great force to the act of Elijah, who, in an ecstasy of joy and zeal at the triumph of Jehovah, and desirous to 'honour the King' who for a brief moment had honoured God, when the hand of the Lord came upon him, girded up his loins, and ran before Ahab to the entrance of Jezreel-- that is, for a distance of some twenty miles or more across the plain of Esdraelon the man of God acted as the sais or runner of the King, clearing the way for his chariot and announcing his arrival!'' [Palestine Explored, Rev. J. Neil]. Does not this office of outrunner explain the figure of Hebrews 6:20: ''whither Jesus entered for us as a forerunner''? He who, in His condescension, has said that in heaven ''He will gird Himself and make (His people) sit down to meat, and will come forth and serve them,'' is pictured here as having entered only a brief moment earlier to announce their arrival and to be prepared to receive them there [Luke 12:37]. Elisha's was a ministry of blessing and healing. In this he was a type of Christ. We have, moreover, in the life and miracles of Elisha a series of most beautiful lessons on Christian life and service. ''Ploughing one day with his father's oxen and servants, in the open country, he saw the outlawed prophet of Gilead coming towards him. Passing by, he cast his mantle upon him. Elisha knew what the sign meant. He was a wealthy man. The call was to follow Elijah as a servant, pour water on his hands, perhaps to die with him. There was no time to think, the decision had to be made in a moment. The call of God in his heart was at once responded to. Obtaining leave to say farewell to his parents, he kills the oxen, smashes up the implements, and shows to all his companions that he has no more to do with his former life. God is calling each one of us, let us follow at whatever cost'' (W.H. Wilson). 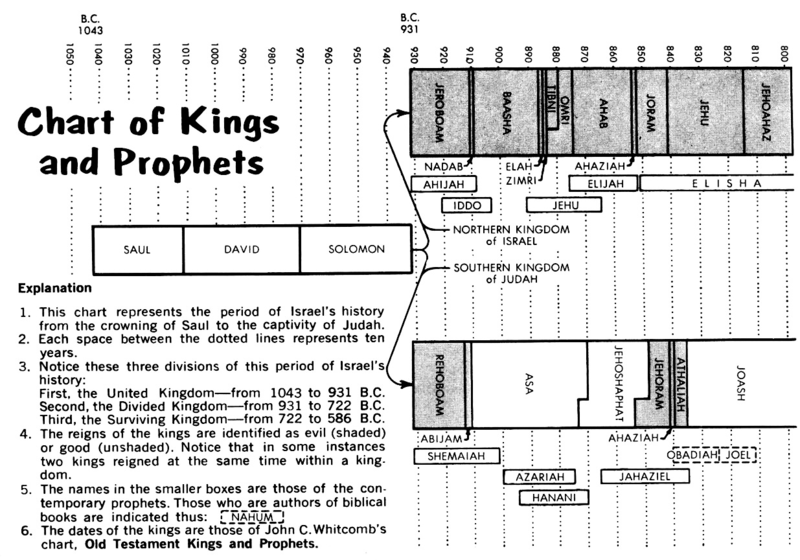 The books of Samuel, Kings, and Chronicles present the history of the Kingdom of Israel. The first four give it from a human standpoint, and in Chronicles, it is seen from God's viewpoint. When 1Kings opens, Samuel is dead and David is dying. 1Kings 2 tells how this shepherd, warrior, king, and psalmist went to be with the Lord. Solomon, David's son, then ascended to the throne of all Israel. This book is important because it tells a story of sharp contrast: first, Israel's greatest splendor; second, Israel's tragic downfall. After Solomon's death, there was a rebellion. The nation divided into two kingdoms-- Israel in the north and Judah in the south. King after king led the people into idolatry. It's the old story of sin followed by punishment. Two men stand out more conspicuously than all the rest named in 1Kings-- Solomon and Elijah. The story really centers upon these two leaders. As we study these men, we fulfill the purpose for this volume-- to see Christ in every book of the Old Testament. Jewish legend says that Solomon could even converse with the beasts of the field. His proverbs, 3,000 of which are recorded, demonstrate the great wisdom that God had given him. What marvelous guidelines they are for the conduct of life even now! Peace and prosperity (1Kings 4:25). Solomon's reign was an unusual time for Israel. The land had been torn apart by war. Now came a time of calm, of peace. ''And Judah and Israel dwelt safely, every man under his vine and under his fig tree, from Dan even unto Beersheba, all the days of Solomon'' (1Kings 4:25). 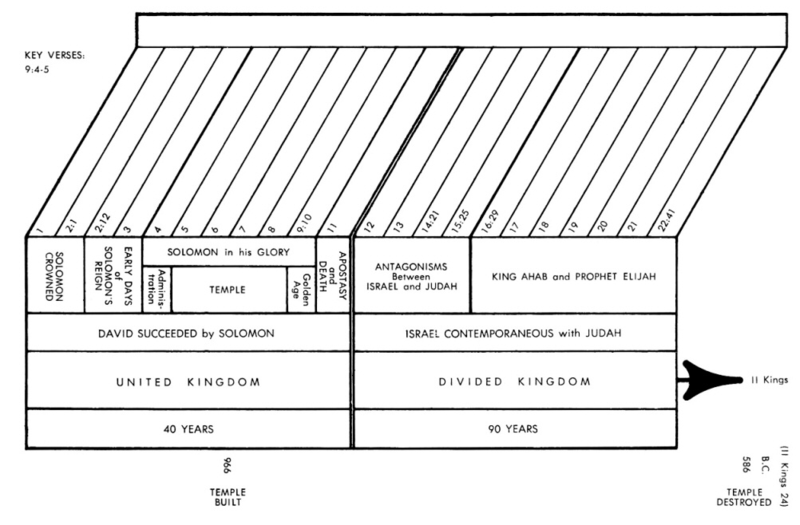 The building of the temple (1Kings 5-7). Solomon's temple was unsurpassed in his day for its splendor and luxury. It was the crown jewel of Solomon's reign. Out of Israel came 30,000 men working in relays of 10,000 per month. In addition, 150,000 ''strangers,'' 70,000 of them carriers and 80,000 stone workers, along with 3,300 supervisors, assisted in the work. God enters the temple (1Kings 8). When the structure was completed and dedicated, the glory cloud, the Shekinah, came down and filled it. This was the visible manifestation of the presence of God in the midst of His people. The visit of the Queen of Sheba (1Kings 10). This influential ruler said to Solomon, ''It was a true report that I heard in mine own land of thy acts and of thy wisdom'' (1Kings 10:6). The wealthy ruler was so impressed with what she had heard and seen that she gave the glory to God, saying, ''Blessed by the LORD thy God, who delighted in thee, to set thee on the throne of Israel'' (11Kings 0:9). A Gentile queen beholding the wealth and beauty of Solomon's reign is a picture of what God has yet in store for this earth. The gospel according to Matthew begins with the words, ''The book of the genealogy of Jesus Christ, the son of David.'' The designation ''son of David'' immediately brings Solomon to mind, arrayed in all his kingly glory. His reign is a foreview of what will take place when David's greater Son, the Lord Jesus Christ, rules over the earth. God has decreed that a man is going to rule this world in wisdom. Isaiah wrote, ''And there shall come forth a rod out of the stem of Jesse, and a Branch shall grow out of his roots; and the Spirit of the LORD shall rest upon Him, the spirit of wisdom and understanding, the spirit of counsel and might, the spirit of knowledge and of the fear of the LORD, … but with righteousness shall He judge the poor, and reprove with equity for the meek of the earth; and He shall smite the earth with the rod of His mouth, and with the breath of His lips shall He slay the wicked'' (Isa 11:1,2,4). Our Lord's millennial reign will be a time of peace and prosperity. The prophet Micah declared of Christ, ''And He shall judge among many people, and rebuke strong nations afar off; and they shall beat their swords into plowshares, and their spears into pruning hooks; nation shall not lift up a sword against nation, neither shall they learn war anymore. But they shall sit every man under his vine and under his fig tree, and none shall make them afraid; for the mouth of the LORD of hosts hath spoken it'' (Mic 4:3,4). Many nations shall come, and say, Come, and let us go up to the mountain of the LORD, and to the house of the God of Jacob (Mic 4:2). And it shall come to pass that everyone that is left of all the nations which came against Jerusalem shall even go up from year to year to worship the King, the LORD of hosts, and to keep the feast of tabernacles. (Zech 14:8,9,16). How tragic the change! Chapter 10 tells of Solomon and all his glory. Then chapter 11 tells of Solomon's sin, chronicles the beginning of the rebellion by Jeroboam, and records Solomon's death. The division of the kingdom and fall into idolatry soon followed. We naturally wonder why. The answer, of course, is that fallen man spoils everything he touches. From this point onward, the Lord God no longer revealed Himself primarily to kings; rather, He turned to the prophets. From 1Kings 11 to the beginning of the New Testament, God spoke to His people primarily through these specially chosen men. The experiences of Elijah the prophet give us a challenge for today, for he was active in a time of apostasy. The end of our age will also be marked by apostasy, so a study of the evil men of Elijah's day will tell us what may be expected. The same conditions exist now as did then. [King] Ahab had married Jezebel. This wicked woman introduced Baal worship and other forms of idolatry. Ahab was sitting in the place of authority on the throne of Israel, yet he was denying the God of Israel. Similar conditions are sometimes seen in the conduct of the religious leaders of our day. In 1Kings 18 we read of two prophets, Obadiah and Elijah. Obadiah feared the Lord and fed the prophets of God who were hiding in a cave. But he lived in the house of Ahab, a compromising position! Ahab never spoke a word against Obadiah. But concerning Elijah, the wicked king said, ''Art thou he who troubleth Israel?'' (18:17). Elijah did not shrink from a confrontation with Ahab. God's exoneration of Elijah took place on Mount Carmel, and that prophet became the instrument of God's judgment upon the the prophets of both Baal and the groves [ie., places of worship to multiple idols]. In 1Kings, one truth looms large on the horizon: a government that leaves God out, whether dictatorship or democracy, is doomed to failure. Government by man always ends in disorder. Yet even though the thrones of earth disintegrate, the throne of heaven will abide forever. Lesson 7: What Keeps Me from a Divided Heart? 1 Kings 17:1-7 Are You There? 1 Kings 17:1-24 Can God Really Meet Your Need? 1 Kings 19:1-18 What Doest Thou Here? 1 Kings 21:17-29 When God says, "That's Enough!" Spurgeon's Comment: "Of this I have a very high opinion. It is the joint work of Mr. Jamieson, A. R. Fausset, and Dr. David Brown. It is to some extent a compilation and condensation of other men’s thoughts, but it is sufficiently original to claim a place in every minister’s library; indeed it contains so great a variety of information that if a man had no other exposition he would find himself at no great loss if he possessed this and used it diligently." 1 Kings 19:1-4 I Am Depressed, What Shall I Do? 1 Kings 17:1 God Lives! 1 Kings 18:7-16 Where Do We Stand? 1 Kings 18:20-24 Make a Decision! 1 Kings 18:40-46 Rain At Last! What can we learn from the man of God and the lying prophet? What should we learn from the life of Elijah? At some point in life most of us face the problem of dwindling resources. The story of the widow of Zarephath should encourage us to trust the Lord to supply our needs at all times. Spurgeon's Comments on Kitto: "Then, of course, gentlemen, you will economize rigidly until you have accumulated funds to purchase Kitto’s Pictorial Bible. You mean to take that goodly freight on board before you launch upon the sea of married life. As you cannot visit the Holy Land, it is well for you that there is a work like the Pictorial Bible, in which the notes of the most observant travellers are arranged under the texts which they illustrate. For the geography, zoology, botany, and manners and customs of Palestine, this will be your counselor and guide… A work of art as well as learning." Spurgeon comments-"Should always be consulted… Exceeding meritorious. Refer to it frequently… They are not exactly a commentary, but what marvelous expositions you have there! You have reading more interesting than any novel that was ever written, and as instructive as the heaviest theology. The matter is quite attractive and fascinating, and yet so weighty, that the man who shall study these volumes thoroughly, will not fail to read his Bible intelligently and with growing interest." Spurgeon - "It must have cost great effort to make the homiletical part of this volume as good as it is. It is a treasury to the preacher, and is all the more precious because we have next to nothing upon the books of the Kings." 1 Kings 18 Rain At Last! 1 Kings 19 How the Mighty Fell! 1 Kings 19 The "Still Small Voice"
1 Kings 19 "Go, Return!" Taking God At His Word (2 Samuel 7-1-29) -- F. W. Tyler. 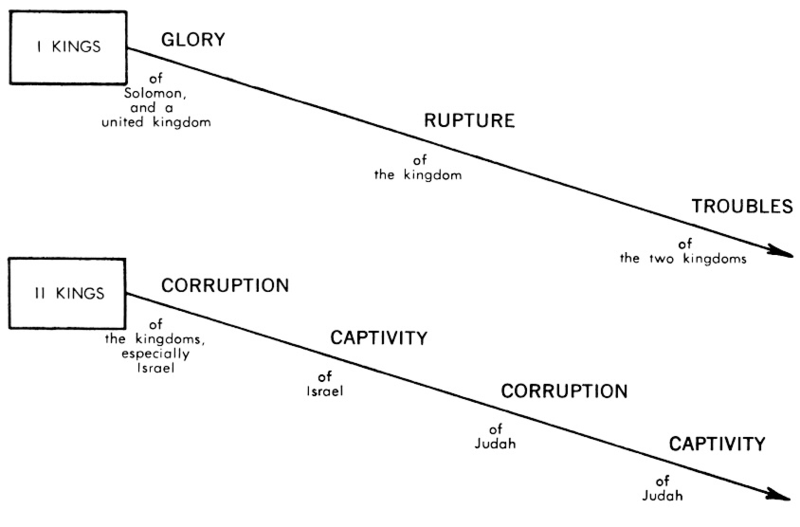 Structure, Context And Meaning In The Samuel Conclusion (2 Sa. 21-24) -- Herbert H. Klement. Theology and Art in the Narrative of the Ammonite War (2 Samuel 10-12) -- John I. Lawlor . 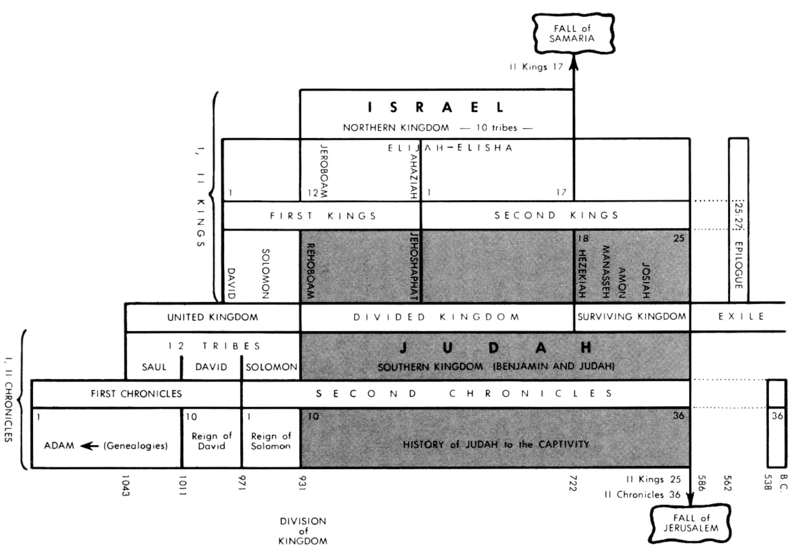 Counterfeit Davids Davidic Restoration and the Architecture of 1–2 Kings -- Peter J. Leithart. DeVries, Simon J. 1 Kings. Word Biblical Commentary. Waco, Tex. : Word Books, 1985. A capable, reasonably conservative treatment of the text. The introduction is most helpful, and the bibliographies are exceedingly valuable. Though pastors will find the critical issues discussed of marginal worth, this is the best commentary on 1 Kings to be produced in many years. Dilday, Russell H. One [and] Two Kings. The Communicator's Commentary. Waco, TX: Word Books, 1987. A well-articulated commentary. The Introduction is brief and to-the-point. Dilday sees the purpose of these book as illustrating the "Sovereign Lord of History using men and nations to work out his redemptive purposes." Throughout there is evidence of the author's wide reading. Prominence is given, however, to liberal and Baptist writers (a strange mix when one considers the historic roots of the Southern Baptist movement). The comments on the text are very brief. While the chapters are well-written, they lack a homiletic outline. They do follow the text, and Dilday's rhetorical acumen is evident on every page. Ellul, Jacques. The Politics of God and the Politics of Man. Grand Rapids: Wm. B. Eerdmans Publishing Co., 1972. Basing his political theory on the fact that the problems of our times are theological and not sociological, the writer shows from a study of 2 Kings how God has provided a blueprint for selfgovernment in the Bible. Rewarding reading. Farrar, Frederick William. The First Book of Kings. Minneapolis: Klock & Klock Christian Publishers, 1981. A thorough and delightful exposition of this history of Israel from Solomon to Elijah. In places it manifests an unwise dependence on the LXX and follows some higher critical theories in vogue at the time. *_______ The Second Book of Kings. Minneapolis: Klock & Klock Christian Publishers, 1981. Treats Israel's history from the ascension of Elijah to the deportation of Judah. Remains one of the most satisfactory works for the expository preacher. Gray, John. I and II Kings: A Commentary. Old Testament Library. 2d ed. rev. Philadelphia: Westminster Press, 1971. †An expansion and revision of the writer's earlier commentary. Includes a vast amount of archaeological and exegetical material, covers every significant verse, and makes a valuable though critical contribution to the study of these books. Jones, Gwilynm H. 1 and 2 Kings. 2 vols. Grand Rapids: Wm. B. Eerdmans Publishing Co., 1984. Capably introduced. Carefully attends to the history, customs, culture, and etymology of Hebrew words. Deals adequately with the text of these two books. Helpful. *Kirk, Thomas, and George Rawlinson. Studies in the Books of Kings. 2 vols. in 1. Minneapolis: Klock & Klock Christian Publishers, 1983. It is difficult to refrain from speaking eloquently of the value of this work. Kirk's handling of the life of Solomon (1 Kings 1-9) is done so well that it suggests messages by the score and provides, in addition, pertinent areas of application. It is instructive as well as revealing, edifying, and also enlightening. And Rawlinson's handling of the remainder of 1 Kings 10-2 Kings 25 provides one of the finest syntheses of biblical history (set against the background of the ancient Near East) that has ever been written. Rawlinson's chronology is lacking, but this in itself is not sufficient to condemn his work to oblivion. The chronology of other similar treatises was also faulty up to the time Thiele produced his Mysterious Numbers of the Hebrew Kings. Any deficiencies, therefore, can easily be corrected by checking Rawlinson against Thiele. What is important is that here we have a work that makes the OT come alive. Nelson, Richard D. First and Second Kings. Interpretation, a Bible Commentary for Teaching and Preaching. Atlanta: John Knox Press, 1987. Examines the Books of Kings, treating the text as theological literature. Emphasizes the literary impact this work had when it was first released. Disregards the inspiration and authority of the text in favor of its canonical importance. Deftly draws readers into an examination of the text. Wallace, Ronald S. Readings in I Kings: An Interpretation Arranged for Personal and Group Bible Study, with Questions and Notes. Grand Rapids: Wm. B. Eerdmans Publishing Co., 1995. “In this concise, practical commentary on I Kings, Wallace succeeds in giving ‘fresh thoughts fresh clothing.’... He draws readers into biblical characters’ lives ... and his love for the Bible is evident as he bridges the centuries to show each stories’ modern practicality. He sees ‘persons like ourselves in situations that we can easily match with our own today,’ and he pulls no punches exposing their human foibles and weaknesses.”--Bookstore Journal. *Whitcomb, John Clement, Jr. Solomon to the Exile: Studies in Kings and Chronicles. Grand Rapids: Baker Book House, 1971. An ideal book for discussion groups. Recreates the OT setting, graphically depicts the cause of decline in Israel and Judah, and draws valid lessons from these incidents that are applied to the needs of the present. Defender's Study Bible - Excellent, conservative, literal study Bible notes from a leading creationist commentator, Dr Henry Morris. See links to notes in right margin. ESV Study Bible -$ for lifetime online access or free with print version. Holman Christian Standard Bible Study Bible - Well done conservative notes. 1 Kings 19:8-14 How Does God Speak to You? 1 Kings 1:5-9, 41-53 ADONIJAH; or, THE CONQUERED REBEL. .
1 Kings 3:1-16 SOLOMON'S CHOICE; or, FULLNESS OF BLESSING. .
1 Kings 10:1-13 A ROYAL INQUIRER. SOLOMON AND THE QUEEN OF SHEBA; . 1 Kings 12:26-33 A MAN-MADE RELIGION. .
1 Kings 13 "ALAS, MY BROTHER!" Or, THE DECEIVED PROPHET SLAIN. 1 Kings 14:1-17 PRAYING IN DISGUISE. .
1 Kings 17:1 ELIJAH, THE SEPARATED ONE. 1 Kings 17:2-6 ELIJAH, THE HIDDEN ONE. 1 Kings 17:7-16 ELIJAH, THE FAITHFUL. 1 Kings 17:17-24 ELIJAH, THE REVIVER. 1 Kings 18:1-39 ELIJAH, THE FAITHFUL WITNESS. 1 Kings 18:41-46 ELIJAH, THE INTERCESSOR. 1 Kings 19:1-8 ELIJAH, THE DOWNCAST. 1 Kings 19:9-16 ELIJAH REBUKED. .
1 Kings 19:16-21 THE CALL OF ELISHA. 1 Kings 21:15-29 ELIJAH, THE REPROVER. 1 Kings 20:30-34 BEN-HADAD'S FALL AND RESTORATION. 1 Kings 22 MICAIAH, THE FAITHFUL. 1 Kings 17:16 The Inexhaustible Barrel - A Powerful Message! 1 Kings 19:1-13 What Doest Thou Here? NETBible notes are in the right panel. You can also select the tab for "Constable's Notes." As you scroll the Bible text in the left panel, the notes are synchronized and will scroll to the same passage. This is a very helpful feature. 1 Kings 3:1-15 What Did God Promise? 1 Kings 4:29-34 What Does He Want? 1 Kings 11:4 What Does He Want? 1 Kings 21:17-29 Friend or Enemy? 2 Kings 2:1-18 How Would You Spend Your Last Day On Earth? 1 Kings 17:1-24 Can God Really Meet My Need? 1 Kings 16-17 God’s Man For The Times! 1 Kings 21 Who Let the Dogs Out? 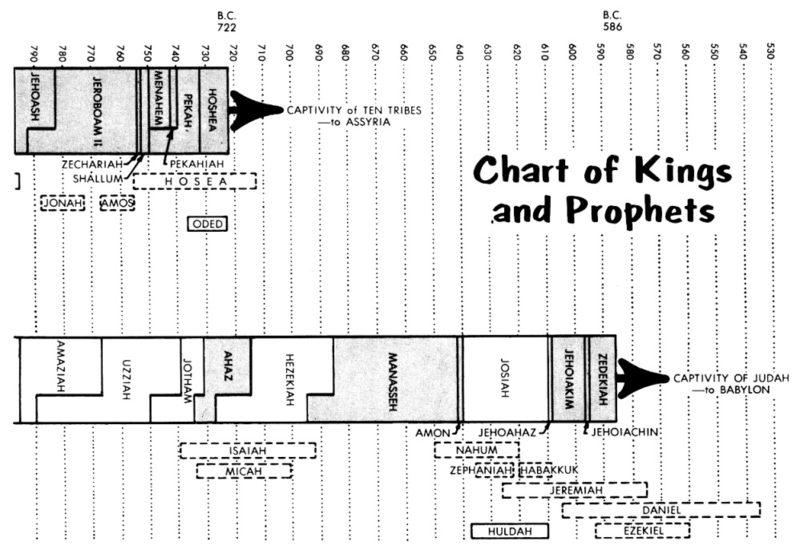 Introduction to 1st and 2nd Kings (Charts Included). 1 Kings 1-2. Solomon Becomes King. 1 Kings 3-4. The Wisdom and Wealth of Solomon. 1 Kings 5-8. The Temple. 1 Kings 9-10. Dealings with God and the Nations. 1 Kings 12. A House Divided. 1 Kings 13-16. The Divided Kingdom. 1 Kings 17. Elijah in the Dry Season. 1 Kings 18:1-16. Elijah and Obadiah. 1 Kings 18:16-46. The Battle of the Gods. 1 Kings 19. The Fearful Prophet. 1 Kings 20-22. Ahab's Fall. 1 Kings 22:51 - 2 Kings 1:18. Ahaziah and Elijah. 2 Kings 2:1-25. The Passing of the Mantle. 2 Kings 3:1-27. The Moabite Conflict. 2 Kings 4. Elisha's Miraculous Ministry. 2 Kings 5. The Story of Two Lepers.